How has the number of people helped/served changed? How have the demographics of people helped/served changed? How have the number of people helped/served from your defined groups changed? How has the number of people helped/served with certain categories of legal problems changed? How has the number of people helped/served with different legal problems changed? How has the number of people helped/served by staff vs. pro bono volunteers changed? How has the number of people not helped/not served changed? How have the demographics of people not helped/not served changed? How has the number of disabled people receiving assistance from our organization changed over time? 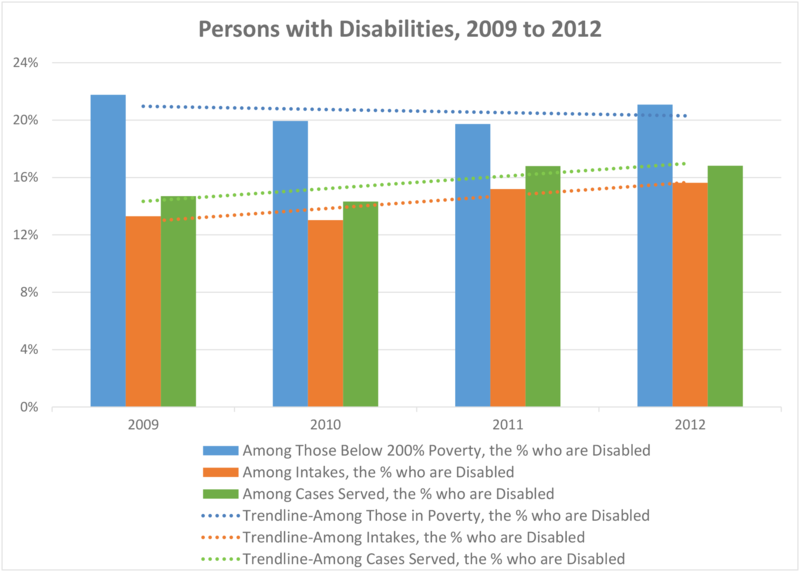 And how does that trend compare to the trends in the number of eligible disabled people and intakes for disabled people? How do the trends in intake numbers and cases served numbers compare to the trends in eligible disabled population numbers? What have been the annual changes in intakes and cases served compared to the annual changes in the eligible disabled population over time? How do the trends in the proportion of all intakes made up of disabled people and the proportion of all cases served made up of disabled clients compare to the trends in the proportion of eligible people who are disabled people? If there is a difference in the proportions, is that acceptable? Do you know why there is a difference? Note that some organizations will need to be creative in their methods of identifying disabled clients. If there is a field that indicates client disability, make sure to use it. But you may need to supplement it with additional data, such as sources of income that may include SSI, SSDI, Veteran’s disability benefits, etc. Determine which fields from your case management system you will use to define disabled clients. Using that definition, find the numbers of intakes and cases served for disabled clients over the last 5 years. Enter those numbers in an Excel spreadsheet and calculate the percentage of total intakes for disabled clients compared to all clients and total cases served for disabled clients compared to served cases for all clients. In the “topic or table name” box, enter C18131 and select GO. Download the C18131 table to Excel for your area for the most recent 5 years (or as many as are available). Enter the numbers of eligible disabled people from each of the C18131 tables into the Excel file with the intake and cases served numbers. Create a bar chart showing percentages of the share of all eligible people who are disabled, the share of all intakes for disabled people, and the share of all cases served for disabled people. Note: Those considered disabled from Pika data include those with Disabled or Severely Disabled fields checked, Income=Disability Financial Assistance or SSI (for client), Problem Code=74 (SSDI), 75 (SSI), 82 (Mental Health), or 84 (Physical disabled rights) or SP-Problem=77-5 (Veterans disability benefits). Sources: U.S. Census Bureau; American Community Survey, 2009, 2010, 2011, 2012 ACS 1-year estimates; Tables S1701 & C18131; generated by Rachel Perry; using American FactFinder; http://factfinder2.census.gov (March 2014) & Legal Aid Pika data 2009-2012. 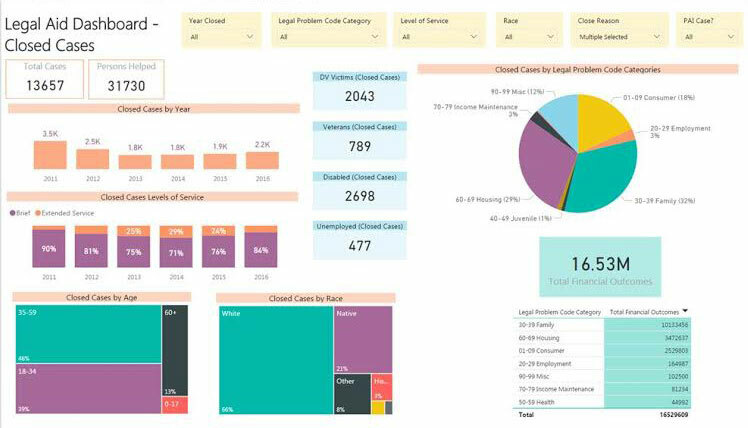 With your case management system data exported to Excel, you can use MPBI to easily create visuals like the ones in the Closed Cases Dashboard below.